The weather has been lovely and bright with sunshine and blue skies here although the gritters are now around on the roads late at night due to falling temperatures, it’s amazing we’ve had no rain now for four or five days, I’m fairly sure that’s a record for this year! We drove up to Dunkeld, it’s one of my favourite wee towns, a scenic place to go for a walk and have lunch. Then we drove a further ten miles or so north to Pitlochry, a much bigger town, it definitely feels like you’re in the Highlands there, it’s a bit touristy but for me the biggest attraction is the second-hand bookshop, situated in a building at the railway station, just a few steps away from the platform. The books are sold in aid of several local charities. I’ve always been very lucky finding books there, but as I was going in a man was coming out, he had an armful of books and it turned out that the place was heaving with book lovers. I hoped that they had left me something to buy! Pitlochry is well off for second-hand bookshops as there’s another one in a street off the high street, it’s called Priory Books and I was really pleased to get Troy Chimneys by Margaret Kennedy there, a nice old hardback with its dust jacket too. I couldn’t say no to a British Library Crime Classics anthology of short stories called CRIMSON SNOW Winter Mysteries. Perfect for reading around Christmas I think. 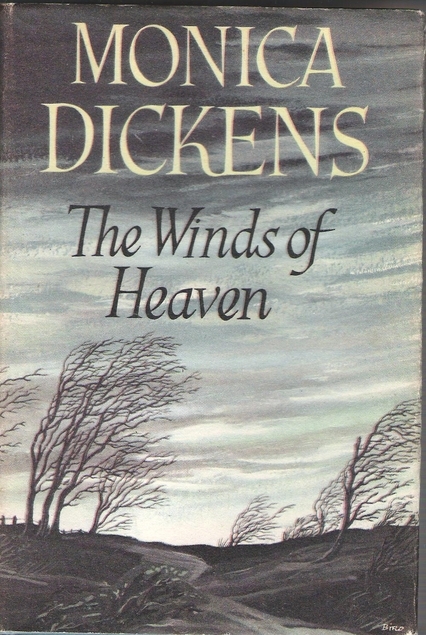 The Winds of Heaven by Monica Dickens was first published in 1955 but I believe that Persephone Books have reprinted it recently. The year is 1951 and Louise has been recently widowed, she’s 50 something and her marriage wasn’t a happy one as her husband was self-centred and over-bearing, showing her no respect or love. Louise believes that the fact that she gave him three daughters instead of the son he craved made him behave as he did. Unfortunately it isn’t long before Louise discovers that her husband has left her more or less destitute, he was heavily in debt and the house is mortgaged. This means that she has to rely on her three daughters for everything and although they are all very different characters they are all cold and reluctant to have their mother living with them, so they take turns at housing her for a few months at a time. The daughters have taken their cue from their father. Louise feels unwanted and burdensome and does everything she can to be almost invisible in her daughters’ homes. On a visit to a London tearoom Louise is befriended by a man who sells beds in a department store. They are both lonely but this relationship seems doomed to fail as they are both rather socially inept. I enjoyed this book which portrays south of England suburbia and its snobbish inhabitants so well, the pushy parents, social climbing and hypocrisy. The only gripe I really have about it is that Louise’s gentleman friend – who it turns out is a published writer of crime fiction ‘shockers’ as well as a bed salesman – is a good character who didn’t appear often enough in the book for my liking. I haven’t been one for joining in many challenges, in fact I’m not a big joiner of anything like clubs, but this year I hope to join a few more, certainly the Reading My Own Damn Books Challenge hosted by Estella’s Revenge – because I really have to concentrate on my books rather than reading those from the library. To encourage me and make my reading a bit less – hmm what shall I read next … decisions decisions -ish … I’ve decided to publish a list of books I intend to read soon. So starting with March, yes amazingly it’ll be March in just over a couple of weeks, I’m going for six must reads although I know I’ll be reading more than that within the month. Have any of you read any of them? If anyone wants to share their ‘forthcoming bookish attractions’ then feel free to do so via the comments. Or you might want to read one of my March books so we can compare notes when the time comes. 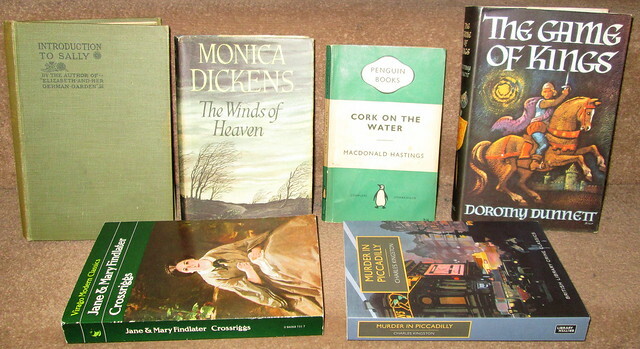 Yet again, I had banned myself from the library to concentrate on my own books, but a visit to the adjoining museum shop to buy a card ended up with me sloping into the library and of course I was seduced by some new books, but it was the unplanned book buying which was quite spectacular. In January it seems that every time I went out of the house I came back with books which I wasn’t even looking for – honest! A visit to an antiques centre ended up with me buying the lovely Folio editions of the Mapp and Lucia books by E.F. Benson. I have them all but just in paperback so I couldn’t resist these, especially as they were so incredibly cheap. I’m not going to tell you exactly how cheap, I don’t wish to cause pain! 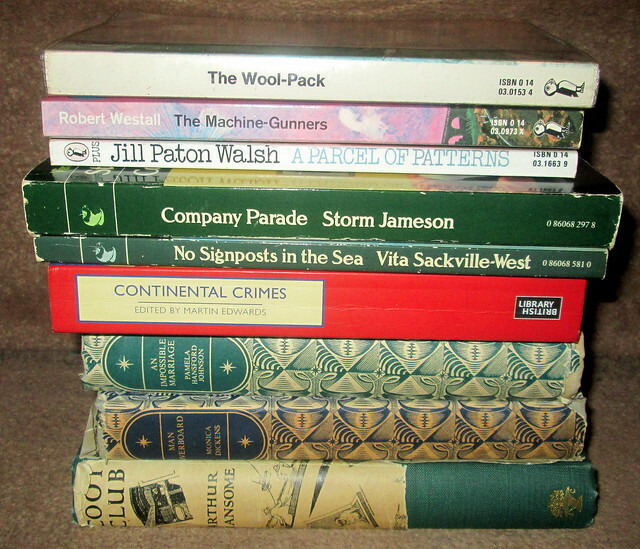 A mooch around some Edinburgh charity shops ended up with me buying the Penguin crimes. I also bought It Ends with Revelations by Dodie Smith. Has anyone read this one? I’ve only read I Capture the Castle, which I really enjoyed. Then when I saw a pristine hardback of All Our Worldly Goods by Irene Nemirovsky I had to buy that too. The Selected Travel Writings of Robert Louis Stevenson called Dreams of Elsewhere. Taking my library books back I swore I wasn’t going to borrow any more books, well I stuck to that but I couldn’t help just glancing at the bookshelves which hold the books for sale, Some Tame Gazelle by Barbara Pym jumped out at me – really it did! The Angel in the Corner by Monica Dickens, I haven’t read anything by her for getting on for 40 years, hard to belive it but true. I also bought The McFlannels See It Through which is the second book in a humorous Scottish wartime series, but I don’t have the first one yet. The Children of the New Forest by Captain Marryat. It’s a children’s classic which I’ve never got around to reading. Of course it’s set in the English Civil War, which historians now recognise involved the whole of Britain, some of them are now calling it the War of the Three Kingdoms. Also Nan of Northcote by Doris A Pocock, which is set in a girls school and was published in 1929. It cost me all of £1 and it could be absolute garbage but I love the cover. Scottish Gardens by Sir Herbert Maxwell, published in 1908 and it has lovely illustrations of some gardens which I’ve visited. I’m sure some of them don’t exist any more but I’m going to track them down and visit the ones I can, to see how they have changed over the years. The book is a beauty and was still a bargain, it’s for sale on the internet for much more than I paid for it. I’ve also discovered that the author was Gavin Maxwell’s grandfather. When I was a teenager I loved his nature books which are set in Scotland. As you can see, I’ve got to get on with my reading!